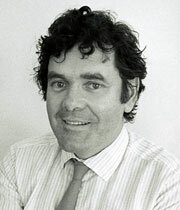 Back in London in the spring of 1968, after 18 months in America, Rice returned to work at Ove Arup & Partners. He joined Structures 3, one of Arups' four structural design departments, working from Soho Square in central London. The executive partner of the group was Edmund (Ted) Happold (later Professor Sir Edmund Happold, 1930-96), and Rice set to work under Happold on the roof of a new conference centre in Mecca, Saudi Arabia. Its designers were Frei Otto (Frei Paul Otto, b.1925) and Rolf Gutbrod (Konrad Dietrich Gutbrod, 1910-99), who were to play a significant part in Rice's career. Structures 3 had emerged from a 1967 reorganisation at Arups that lead to the creation of divisions for the first time. The third division was the responsibility of partner Povl Ahm (1926-2005), with Happold in charge day-to-day — Ahm was also starting the practice's civil and infrastructure group at the time. Happold gave the division its name and under him, Structures 3 would become one of the most formidable engineering design groups in Europe. Happold was a natural leader, bristling with energy. According to then senior partner Jack Zunz (Sir Gerhard Jacob [Jack] Zunz, b.1923), it was felt that the team in its early form wasn't strong enough technically, and Ahm pursuaded the partners that Rice, with his impressive Sydney Opera House track record, should join it. Rice was appointed Associate Analyst. In 1966, architect Trevor Dannatt (James Trevor Dannatt, b. 1920) and Ove Arup & Partners (in the form of Happold) had submitted an entry for a design competition for a conference centre and hotel in Riyadh, Saudi Arabia. The entry's third place was ignored by King Faisal, who decided to build the design, along with that of fellow competitors Otto and Gutbrod, whose project would be realised in Mecca. In January 1967, Happold and Dannat were in Saudi Arabia negotiating a contract, and it was here that the two teams met. Otto and Gutbrod asked Happold to engineer the Mecca project too, beginning a long and fruitful working relationship — and a lifelong friendship. The two conference centre projects became Structures 3 assignments, and for Rice, contact with Otto introduced him to non-linear analysis. For Arups, Ian Liddell (William Ian Liddell, b.1938) would lead the Riyadh team and Ting Au the Mecca team. 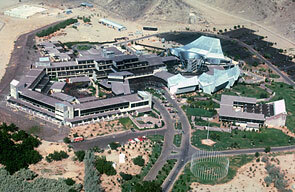 The Mecca Conference Centre and Hotel (completed 1974) was a demanding project, with several suspended cable roofs. As with the Sydney project, computer analysis was needed but computers weren't readily accessible. The geometrical analysis was done on the mainframe at Manchester University. The largest span is 46m and this part of the complex by 1997 was still the "lightest heavyweight" roof of its type. Steel cables and stiffening members support a sandwich of timber, insulation and corrugated aluminium. 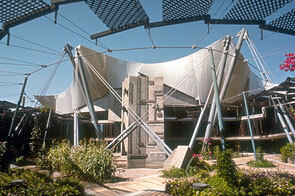 The project won an Aga Khan Award for Architecture in 1980. Under Happold, Structures 3 continued its close association with Otto and his team in Stuttgart, working on other lightweight structures and fabric projects. Together they would form the Lightweight Structures Laboratory in 1973 as a specialist group within Structures 3, and Happold included Rice in this team, along with Liddell and Michael Dickson (b.1944), both future founding partners of Happold's consultancy Buro Happold. In the late 60s and early 70s, Structures 3 undertook a very varied range of projects for buildings, and Rice worked on many of them. He contributed to two notable UK arts projects of the period that were experiments in theatre form, both designed by architect Renton Howard Wood Associates (now RHWL Architects) — The Crucible Theatre (completed 1971) in Sheffield with its octagonal full-thrust auditorium, and Warwick Arts Centre (completed 1974) in Coventry. Also with Renton Howard Wood, Structures 3 worked on Taylor Woodrow's redevelopment (completed 1981) of St Katharine Docks, near Tower Bridge in London — a project won in competition. The historic dock structure (1829) is by Thomas Telford (his only London project). Work with Otto and Gutbrod introduced Rice to a collaborative approach to working with architects, and to projects where the brief was loosely defined, providing room for engineers and architects to develop ideas together. But the link with Otto was also significant for another reason as it was through Otto that architect Richard Rogers (Richard George Rogers, b.1933, later Baron Rogers of Riverside) was introduced to the work of Structures 3, and this would lead to the project that Rice later claimed as the real start of his career — Centre Georges Pompidou (the Beaubourg) in Paris. Richard and Su Rogers were invited to submit an entry for a competition to design a new stand for Chelsea football ground. They invited Otto to join them, who in turn suggested approaching Happold for the engineering (up to this point, the Rogers had worked almost exclusively with Anthony Hunt). They didn't win but the project set the engineers at Structures 3 thinking about the value of entering competitions — not so much to win them but to provide opportunities for exploring design ideas and ways of working, and to try working with architects that were new to them. Early in 1971, the French government announced the competition for the Beaubourg and Happold organised a response, using his own money to pay the fee for the brief. He approached Rogers, who had just established the practice Piano & Rogers with Italian architect Renzo Piano (b.1937). There was some ambivalence about entering, but Piano and Su Rogers were keen and, late in the day, an entry was prepared. It was submitted in June 1971. The Structures 3 Beaubourg competition team consisted of Happold, Lennart Grut (b.1941), Michael Sergeant and Rice, and it seems much design work took place around Happold's kitchen table. Happold is reported to have described Rice to Rogers as "the perfect design engineer in structures". The competition entry was a true joint effort between the small, little-known practice of Piano & Rogers, and the already renowned and successful Ove Arup & Partners, in the shape of Structures 3. However, the architects did start with a clear idea of what they wanted the building to be — an expression of a new relationship between people and culture. Out with elitism, in with an open, friendly, classless approach. Influenced by the ideas of Archigram (founded early 1960s), Cedric Price (1934-2003) and Joan Littlewood (1914-2002), the project was imbued with 1960s optimism, and the structural design followed through on the philosophical ideas, rejecting more-obvious solutions. As Rice expressed it in An Engineer Imagines, "We did what we liked" — the team treated the project as an exercise in imagination. The "information machine" would have a large open steel frame, inside which anything could happen. Large-span beams were too obvious, so another solution was found, and the joints supporting the floors became a focal point. The floors would be moveable and the columns filled with water for fire protection. It was all done very quickly. At the time, Structures 3 was also working with architect Tom Hancock on what would be the runner-up entry for the competition to design an extension to the Houses of Parliament in London (the winner was Spence & Webster with Anthony Hunt). The Beaubourg result was scheduled to be announced on 13th July 1971, and the team broke off work and went to Paris. The competition had attracted 687 entries from all over the world, which was pretty daunting. But against all odds, Piano & Rogers with Ove Arup & Partners had won. Despite the immensity of the news, Rice was unable to stay in Paris to meet the French President with the rest of the team, as Sylvia was hospital in London — she gave birth to their fourth child, Nemone Kate Rice, that same morning. 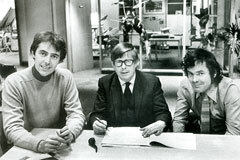 Lennart Grut (at left), Ted Happold and Peter Rice in the offices of Ove Arup & Partners in 1971, the year of the Centre Georges Pompidou competition win. Happold was in day-to-day charge of Structures 3, the hugely influential Arups design group. Rice was appointed Associate Analyst. Mecca Conference Centre and Hotel, Saudi Arabia, from the air — the hotel is on the left and the auditorium in the top right corner. Rice worked on this project on joining Structures 3, the division of Ove Arup & Partners led by Ted Happold. 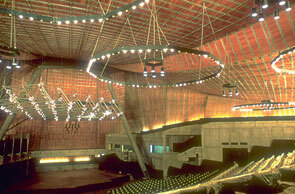 Section through the auditorium and its suspended cable roof. Steel cables and stiffening members support a sandwich of timber, insulation and corrugated aluminium cladding. The courtyard in front of the auditorium.